Version 2.4 is out and has some great features that make your work even easier! We want to introduce you to some of the new features which are now available. We would like to highlight the Asset Library, Web Standalone, faster video rendering and adjustable grass settings. 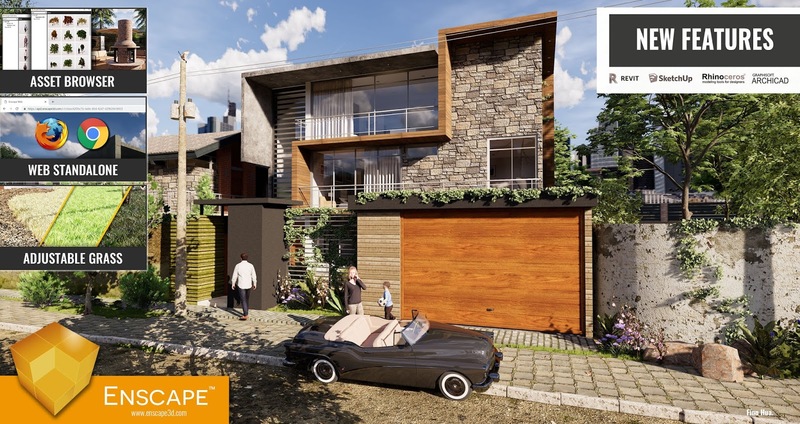 With Enscape 2.4 you can create even better renderings. And you have more time to do the real design work! Click here to download the new version! To reach a remarkable level of realism, we have added the Asset Library to your Enscape license. You can choose from various people, vegetation and other assets. Just drag one into your model and then rotate and scale to match it to your needs. And this is just the initial set of content: we are going to add more assets in coming releases. You know the Executable Standalone. Now we added the Web Standalone. Just share your project in our cloud and send your client a link to open in a browser. They can walk through and explore the model without installing any additional programs. Our new options for adjustable grass streamline you landscaping workflow. Specify grass height and variety to find the right type of grass for your design. You can now take better advantage of video animation. The video rendering speed is up to six times faster than it was before. Enscape is brought to you by Enscape. 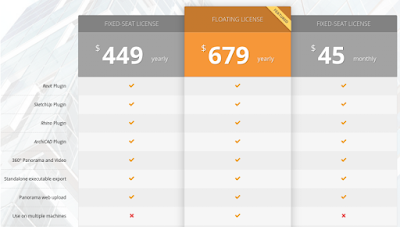 Pricing is as follows. There's more information available on the Enscape website, and on the Autodesk App Store.